This was recorded on the Stan Kenton Orchestra CD Live at the Tropicana. Here is a slow, gutty, "down-home" type of blues written for and recorded by the Stan Kenton Orchestra on the Adventures In Blues album. As recorded by the Stan Kenton Orchestra on the CD "Live at the Tropicana," this slow, bluesy piece is a wonderfully understated chart that features an easy-to-play, written piano solo. As recorded by the Stan Kenton Orchestra on "Viva-Kenton," this delightful Latin chart has solo space for tenor saxophone and features a very hip melody by Gene Roland. 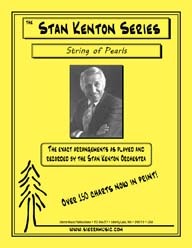 This was recorded by the Stan Kenton Orchestra on "Adventures in Jazz. This is the exact arrangement as played on the "Live at the Tropicana" by the Stan Kenton Orchestra. This is NOT the Glenn Miller version of this tune. This was recorded on the Stan Kenton Orchestra CD "Live at the Tropicana.